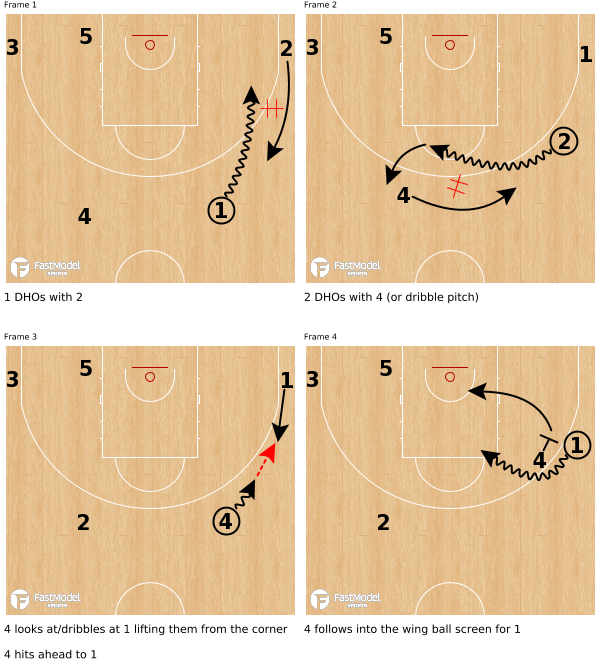 Transition Offense + False Motion: Two Early Offense staples from the Fred Hoiberg Pitch Series. To play seamless basketball, flowing from transition offense to halfcourt offense without pause is the first step. A quick pitch ahead may net an early advantage that the offense can exploit for an easy basket. When there is defensive balance and no offensive advantage, however, a simple early offense package can yield a small advantage for the offense which they can then use and maintain for the remainder of the possession. 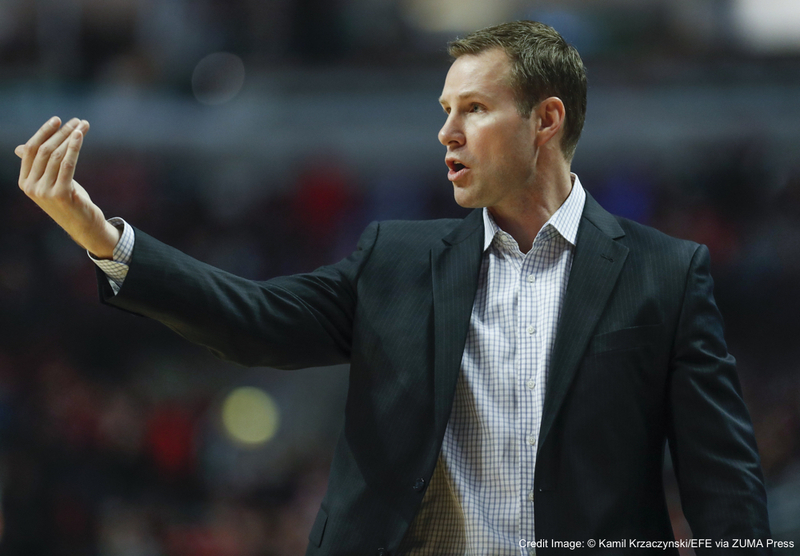 The Pitch Series from current Chicago Bulls and former Iowa State head coach Fred Hoiberg is an example of a read-based package where the ball handler makes the decision to either “pitch” of “flip” the ball to a teammate and players respond with quick corresponding options. The Pitch Series combines quick sequences of dribble handoffs (DHO) and ball screens with a touch of false motion to create an advantage. The “mix” is the pass against the grain back to the point guard. On airtime of that pass the post player (5) sprints up to set the slot ball screen to create the advantage. 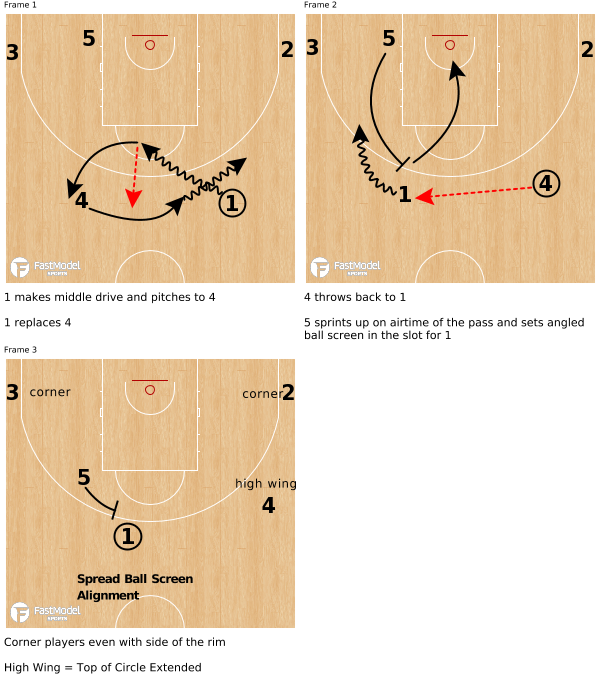 In the video below, Iowa State wants to get their terrific point guard Monte Morris in a spread ball screen and the false motion of “Pitch Mix Angle” to move the defense and conceal it. The “pitch” and the “flip” terminology differ in that a pitch is a DHO with the trailer and a flip is a DHO with the ball side wing(2). “Flip Get” is a way to use a touch of false motion from the break to conceal the wing ball screen for the point guard(1). The point guard(1) DHOs with 2 and 1 gets to the deep corner. 2 then pitches to trailer(4). Upon being dribbled at, 1 flashes to the single gap for a wing catch from 4. 4 then follows into the wing ball screen. The defense has been moved and forced to defend a couple of false actions before the action to create the real advantage is initiated. The Pitch Series is an example of simple, quick sequences that can be run seamlessly from the break that can yield a small advantage for the offense. From there you maintain the advantage using conceptual offense principles. In addition, using a splash of false motion and bringing the ball back to your primary ball handler can make the advantage-creating actions harder to guard. For more Pitch Series options check out “Early Offense Favorites” featuring the Pitch Series plus the 21 Series and Drag Break!